Copada in primary colours: This one started off as a quick sketch and an excuse to use some primary colours for a bit of colour therapy today - I wanted to get away from grey for a while. I didn't think it would go anywhere, but I liked the end result - probably as it is so different from my normal colour scheme/s. 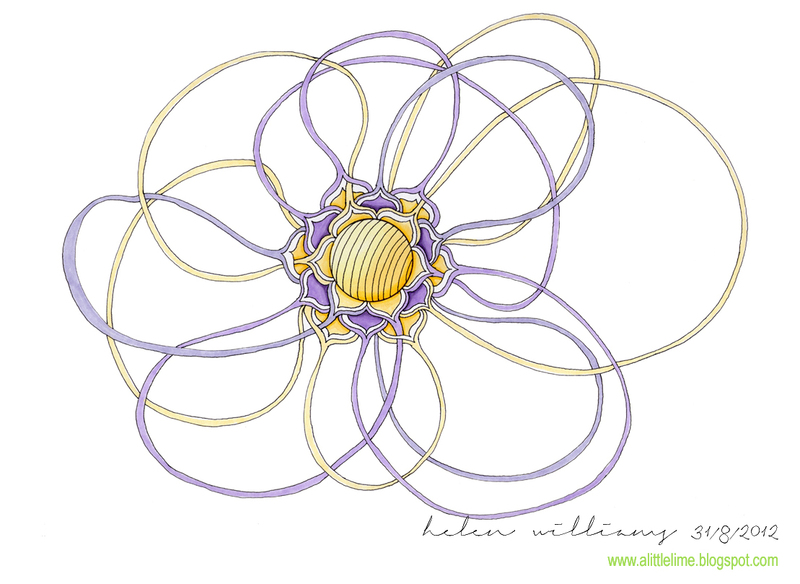 I have seen some cool challenge responses - loved the fill on copada in both didisch's (stripes) and Mariet's ( flowers) challenge pieces - they have inspired the daisy & striped fill on the copada elements in this drawing. A pen update! I am happy with the zig so far - though it probably only has one more drawing in it. I don't know whether I am training myself to have a (slightly) lighter touch. I am still slowly grinding it into the metal tube, but it lasted longer than the previous pens have. I will switch back to a micron once I have finished with this one to compare. Oh all your designs are just adorable. 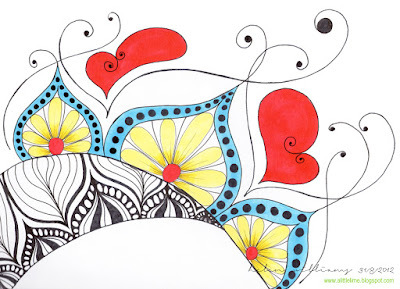 The one in primary colors, the string flower and the feather all three just beautiful. Such a difference in them all with all unique character. All lovely designs. The feather is amazing, and I really like both your other color choices. Have I ever told you how much I love your flowing, gorgeous style? Well I LOVE YOUR STYLE! So nice to see how you play with the tangle and come to a beautiful finished work. I love your delicate style! Wow, love your process and the finished products are soooo lovely. Super dooper, gorgeous!!! 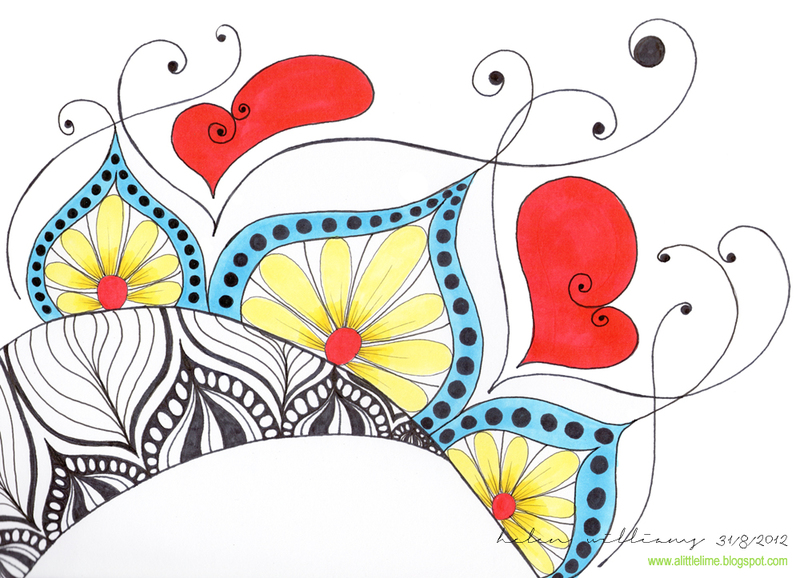 The sharing aspect of Zentangle and passing on ideas with the inspiration that flows from one to another is so special. I LOVE your copada feather!! all your designs are great but it is my favorite!! No problem at all :) Thanks for your lovely comments. 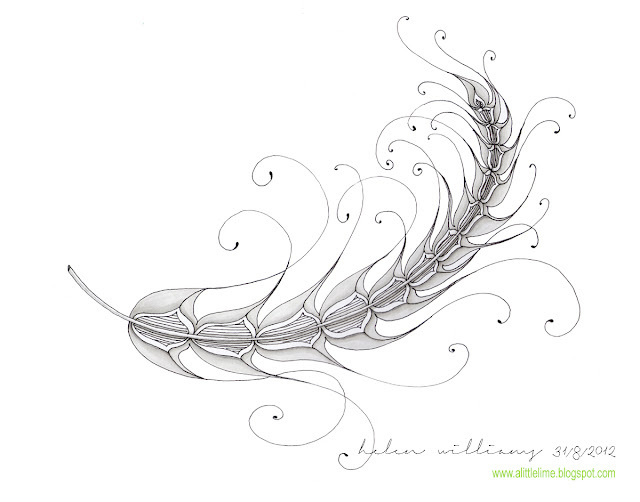 these are wonderful - i really like your feathers i've been seeing on your blog - and this one is excellent! I do love your work, it is so light and flowing and always pretty. Your designs are devine, beautiful and flowing, love them. Great designs. I love your art. It's so free flowing. The feather is especially beautiful. Thankyou everyone for the lovely comments :) I love how these challenges push me to try out new patterns. These designs are all fantastic and it's good to see your brainstorming page as well to see how the ideas develop.